In addition to living life on the physical edge, last Friday, I also went to my first ever Julep Maven Meetup! What's a Meetup, you ask? Well, it's a place for Julep enthusiasts to get together and chat about fun pretty polishes and cool beauty products, while sipping perfectly chilled wine and munching on yummy aps. Okay, so that may not actually be an official description but it sure was my experience! Haha! It was in the Lobby of the swank-tastic Thompson Hotel, where even the wallpaper was awesome, as it had a black and white faux bookcase pattern and cool, vintage lightbulb dangly chandeliers. There were two glossy white tables set up, one with Julep products and the other displaying a delightful assortment of drinks and snacks. I had just gotten my bearings when Jane came up to introduce herself. She was so freaking nice and approachable that I just stood there and stared stupidly smiled. I'd hoped I'd get to meet her but it never even occurred to me that she'd make the first move. Not only that, but at one point, she was serving people drinks while doing a product demonstration for Julep Bare Face Cleansing Oil. Yes, you read that right, guys and gals, the CEO of Julep was pouring wine and loving every minute. Like, genuinely. And talk about being passionate about products! She knew everything about everything, right off the top of her head. Plus, she was funny. 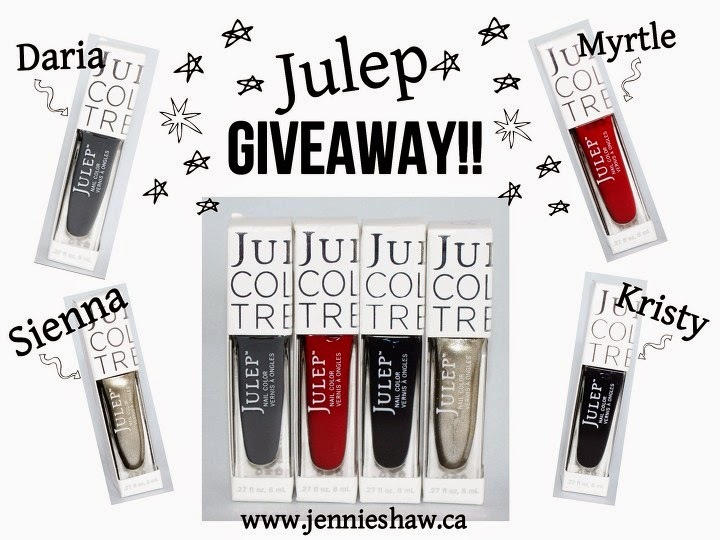 Not only that, but she wanted to get feedback on which products Mavens loved, and things they wished Julep offered. There was even a box to leave suggestions. I've literally never felt like such a valued customer. I know that right now, Jane kind of sounds like a robot because what CEO is genuinely happy to mingle with customers? (not any I've ever met) But I swear, she's real. Also? She wears marvellous accessories. And that says a lot about a person, in and of itself, doesn't it? No? Just for me then? Haha! The other Julep rep was Jane's assistant, Lissa, and she was just as awesome! Enthusiastic, warm, and a seriously cool gal who just happens to be the inspiration behind one of my favourite Julep teals: the aptly-named, Lissa. When we were bonding over having first names that people think are short form for something else chatting, she mentioned the polish and it rang a bell because teals are kind of my jam and, sure enough, when I got home, I found that I did a mani with it a few months ago. Haha! Anyway, between the spread of products, drinks, and snacks, and the two fantastic hosts, it was a super fun couple of hours. Jane and Lissa truly made an enormous effort to make sure everyone was comfortable, and also explain which products they'd brought for us to try. 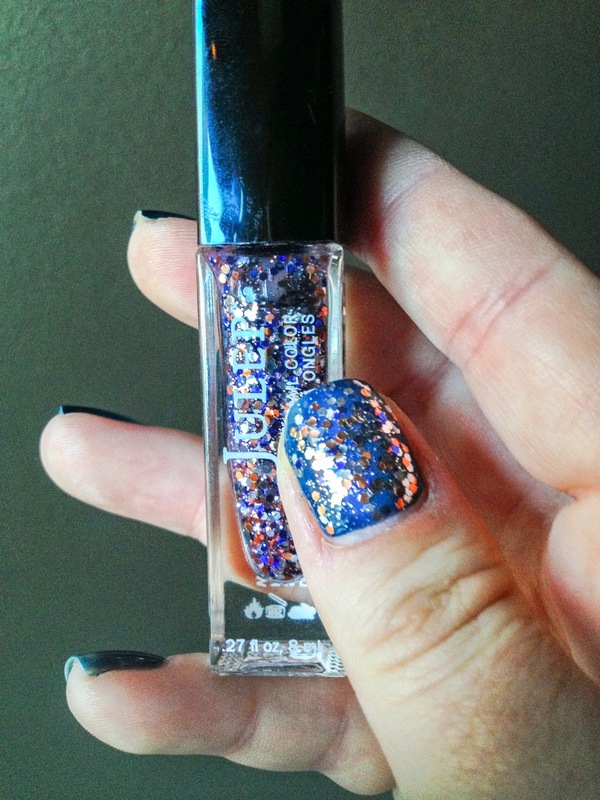 We got previews for November's colours, as well as the holiday collection which is to die. Seriously, people. See that glitter on the far right hand side of the six polishes up there? Its name is Tara and it almost killed me with its beauty. This picture doesn't come close to doing it justice, but it was the best one I had. When that collection comes out, I'm going to be all over it...and then it's going to be all over my nails because, ohemgeeitssofreakingpretty. Also, because this was a Julep event, I did a special Julep mani, featuring the two colours from my September box, as well as a blue I already had. So after you link up to show off your pretties, keep scrolling down to enter! So if you do any breast cancer awareness nails please come and link them up. Wow, that sounds like such an amazing night! And incredible that Jane was such a lovely woman! Sounds so humble! 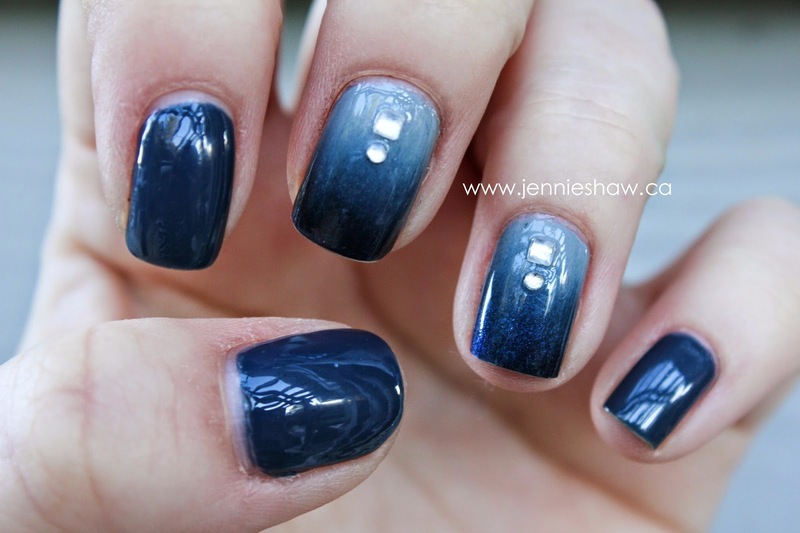 And your mani, especially that gradient with the glittery tips, gahhh so gorgeous!! That's really cool. I love meeting people & they were really nice too. I'm hoping to meet up with some local bloggers soonish. 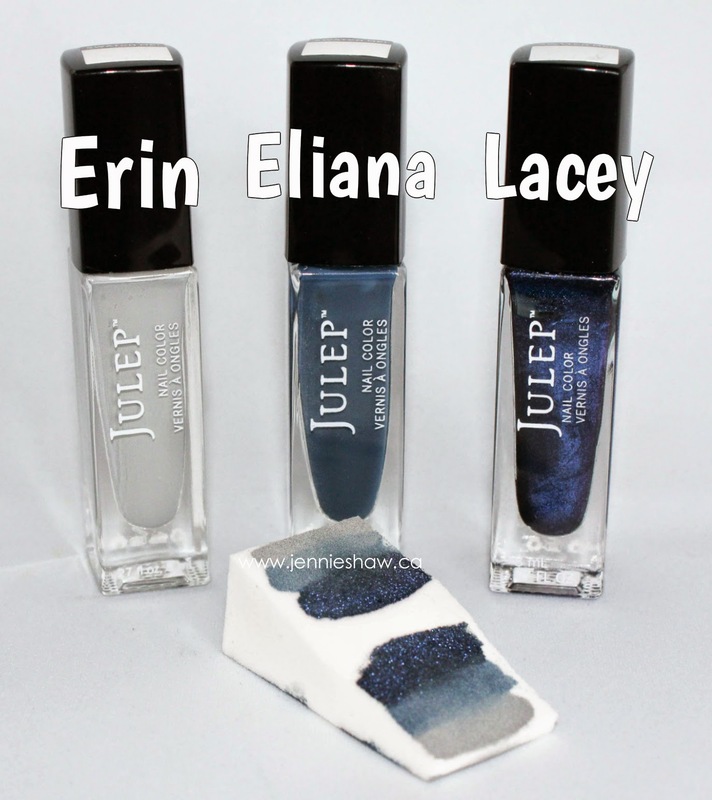 I still haven't tried Julep, but I see a few colors that look really pretty that you posted. How fun! I am linking up but it will post tomorrow! I love "wine" and dark green!! Or dark purple! I like a deep plum color. I'm really loving plum shades this Fall. Thank you for having the giveaway! I usually go for any shade of blue, but for fall, I like greens, especially darker shades. How very cool!! I'm not entering because I love to paint my nails but a) I don't do the linkups, and b) shipping from Canada to here is a pain. I'm glad you had such a good time--that glitter looks pretty glorious! I love dark purples and reds for fall! And burnt oranges. And darker greens. Okay, I can't pick just one! I prefer burgundy and khanki/olive shades for fall! red and dark! thanks, lovely chance!!! I like dark colors like plums, navy and burgandy for fall!! My wife loves nail polish. This would be great for her. She usually goes with darker colors. My go to fall colour is a velvet silk like red. :) Thanks for the chance!